Amazon.com description: Product Description: This volume offers a much needed shift of focus in the study of emotion in the history of philosophy. Discussion has tended to focus on the moral relevance of emotions, and (except in ancient philosophy) the role of emotions in cognitive life has received little attention. Thirteen new essays investigate the continuities between medieval and early modern thinking about the emotions, and open up a contemporary debate on the relationship between emotions, cognition, and reason, and the way emotions figure in our own cognitive lives. 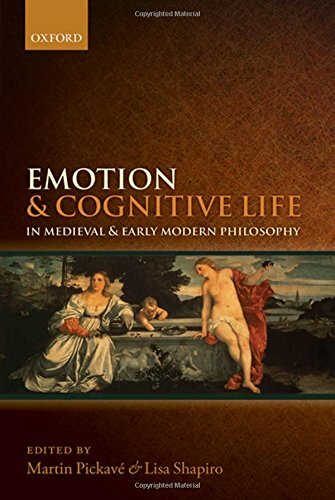 A team of leading philosophers of the medieval, renaissance, and early modern periods explore these ideas from the point of view of four key themes: the situation of emotions within the human mind; the intentionality of emotions and their role in cognition; emotions and action; the role of emotion in self-understanding and the social situation of individuals. About: This volume offers a much needed shift of focus in the study of emotion in the history of philosophy.